Welcome to Smileys Sunset Lake Cabin Lake Seminole has no damage & on the water. 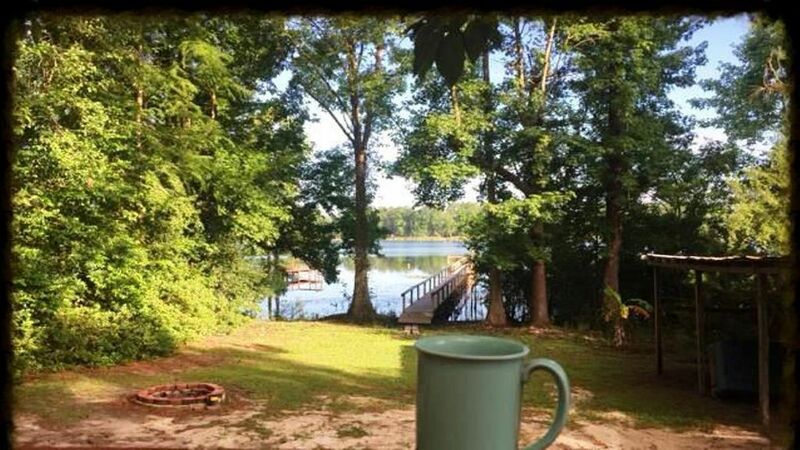 Lake front cabin for fishing, getting away or visiting family in Seminole Cnty, GA. Cabin has 2 full bedrooms, 2 twin air beds and a large screen porch. Ready to relax & fish, Dock in great shape after Hurricane. Lake front Cozy Cabin with excellent nightly rates. Private dock, large screen porch with rockers, large deck overlooking peaceful private lake, private yard, with shelter area to set up fish cookers, fish clean station with running water. A perfect little lake front rustic getaway to relax & fish. "Be Welcoming, Honest & Fulfill Your Expectations" with a clean comfortable rustic lake cabin experience. It's on peaceful & private setting with your own private dock. NO fishing license required if fishing off this dock. Lake at cabin- allows only small John boats with Electric Motors. For Big gas powered boats, cabin is only Half Mile to multiple boat landings into Big Water, Closest public ramp Half mile - 'Cypress Pond Landing' on Cnty Rd 374 or Harvel Pond Park Landing. Seminole State Park 2.5 miles or Spring Creek Ramps @ Big Jim's 2.5 miles or Sealys' Landing 2 miles away. Plenty of parking for 3 trucks/Bass boats. Enjoy day trips to Quaint Small SW GA Towns or nearby Wineries. SW GA's Natural & Beautiful Lake backwoods. This Lake Community remains unspoiled. Seminole State Park offers biking, hiking or canoe & kyack rentals. All inquiries are Welcomed to Ask questions of us & we are always happy to respond. We enjoy helping to make your stay the best. Welcome to a Little Rustic Magical Lake Cabin. Seminole State Park only 2.5 miles from your cabin, with walk/hiking trails, putt-putt, Kyack-Canoe rentals, swimming for kids or adults, bathhouses, etc. 2.5 miles from Seminole State Park, N Lake Seminole, GA. Approx 17 miles from Bainbridge or Donalsonville, GA. Local General Dollar Store & few country stores, 2.5 miles to Big Jims Oyster Bar. The Flint & Chattahoochee Rivers are the 2 rivers that make up Lake Seminole, along with Spring Creek. All areas have great fishing & Hucks also has great fishing right of the dock. Your own private dock, we provide umbrella & there are 2 folding chairs to set up for great fishing on the dock. Or Dinner for Two under Full Moon. We can make it happen! Large private yard, deck. Cabin is on a private lake -waterfront & is less than half mile from Big Water of Seminole, the closest Public Boat Ramp into Big Waters- Cypress Pond Landing-half mile away. 3 window untis that have remote thermostat control. 3 electirc heaters (look like wood burning stoves) in cabin -Always warm & cozy. 4 top dinning table + 2 top table on screened porch, Plus outside table for 4 to dine on Deck with wonderful & peaceful views & Rocking Chairs to relax in after dinner on screen porch. Full screened porch with lots of rocking chairs to relax, read or catch up with family/friends. The views are beautiful from the porch & the rockers are waiting to hear your stories and laughter. Large screen porch overlooking the lake to relax & have morning coffee with nature or enjoy your Fish Fry. Bring your Fryer & set up under the shelters where you can clean catch of day. Lake Cabin. SMOKE FREE Lake Cabin We want our guests to come to enjoy this quiet peaceful setting in our Lake Seminole Community & local area. Smiley' Sunset Cabin is only 2.5 miles from Seminole State Park, 2.5 miles to Big Jim's Oyster Bar! Great Rates for a comfortable, very clean, well decorated cabin on beautiful private lake with private yard. Great for Duck, Deer Hunters & fishing tournaments or anyone who wants to enjoy our lake getaways. Large yard with screened porch/deck to relax with your friends. NO WI-FI Big Jim's Oyster Bar has Free WI-FI Notice*Cell Phone Service: All Major carriers do work in community. May be spotty, depends whether Fish Clean Station/Running Water @ covered shelter area. NO Outside electrical outlets. Thank you for being very accommodating with the additional night stay. Thank you Tim. We were very happy to have you as our guests while fishing Lake Seminole. The cabin is so close to multiple public boat ramps into Big Water & is a such a natural & peaceful Lake Cabin. You are always Welcome back as Repeat Guests. We appreciate you choosing Smiley's Sunset Lake Cabin as your perfect spot to Relax & Fish while here. Glad you got to fish Seminole Ed. All the way from Michigan & qe hope to see you again. You are always welcome back anytime. Nice little cabin with plenty of boat parking. Would definitely stay again. Grae we were so blessed to have a place for yall during the tournament. Always welcome back to stay in any of our places when fishing Lake Seminole again. Congrats! Also glad we had outside outlets & parking for all. Glad to know your Grandad was able to join you & enjoy sunsets off the porch. Come again! A comfortable get away situated right on Lake Seminole. Cutely decorated and had all the necessities for a very nice stay. Yall come back again & welcome to stay in any of our places here at Lake Seminole. GA. Thank you all for ocerlooking the mess in yards from Hurricane Michael. Glad we were able to keep you all close for Thanksgiving with your family here in Seminole Cnty. We were able to provide our cabin to this wonderful Texas family after Hurricane Michael. We hope you all come again & enjoy a blessed Thanksgiving back home in Texas, on your farm. Thank you again Julie for sharing your cabin with us. As a return renter the cabin was again as expected. We thoroughly enjoyed the relaxing quiet and the overall atmoshpere. We grilled out, fished and just enjoyed a relaxing weekend at one of our favorite getaways and Julie was as usual very welcoming and went out of her way to make sure our stay was perfect. We cant wait to come back. Thank you Missy! Glad to always see you coming back to enjoy some fishing & relaxing. You guys know the way back & we look forward to your next stay. FREE WI-FI at Big Jims Oyster Bar/R Cafe, only 2.5 miles away, ask for guest Password. 3 shelters for parking small john boats, large Private yard, Clean your catch of the day in yard at fish clean station with running water. Set up your fish fryers under shelter area or grill to enjoy your screened porch or deck dinning for a great meal and swapping Fish Tales of the Day. Large screened porch with rockers/table/chairs & ceiling fan for relaxing as the day begins or ends, Watch the Sunsets over the water & through the GA Pines. Always fresh clean linens/towels & fully stocked kitchen. Hucks Hideaway Cabin is a Best Kept Secret around N Lake Seminole. Just the right place for a quiet cozy get away from it all. We love Guests that come with a smile in their hearts, excited about creating memories & swappin' fish tales to last a lifetime. We specialize in making our guests comfortable and feel welcomed. In addition to having a great little Rustic Cozy Lake Cabin to stay in, we provide lots of information to help you with getting to know some of our local history of Lake Seminole & immediate surroundings/businesses/restaurants, where to purchase your GA fishing License (if going into Big Water) all prior to your arrival.. We are always happy to share our recommendations for any day trips to wineries or our quaint small towns in SW GA. All cell phones can sometimes be slow all around @ Lake Seminole, GA. TV with DVDs & Weather Radio with back up batteries to keep you informed on weather conditions. Owners are very proactive & will stay in touch with all guests, IF bad weather Safety #1 & we can move you to backup locations. Only 10 miles from Silver Lake! Guided Tours of Lake Seminole are available, Ask Owner for recommendation for guides. Small town shops in Donalsonville, GA with great gift ideas or unique one of a kinds @ Front Porch Marketplace. SEMINOLE STATE PARK only 2.5 miles from cabin. Ski: Seasonal water skiing @ Seminole State Park 2.5 miles away or @ Rays Lake location of Seminole. Free Wi-Fi @ Big Jims Oyster Bar where the locals & vacationers hang out on the water with good friends, great food & the best staff around the lake. R Café next to Big Jims - great lunch/breakfast! Jo's Family Restaurant (great food) in Donalsonville, Ga. Golf courses in Donalsonville & Bainbridge (3) to choose from. Laundry Mat around the corner @ Sunnys' Grocery & Deli on Cnty Rd 374. Owners are happy to go over options or answer questions in advance to final booking. We want you to arrive Informed & Happy. *3rd / 4th/5th guests= $10/ea/per night additional. *Cabin not suitable for minors under age of 7 *Minimum of 25 for anyone signing our contract or paying online* Contract sent once booked, owner requires Acknowledgement Page to be signed/completed & returned. Long term rental amounts, send inquiry, we are happy to discuss, depends on # of guest staying. *CANCELLATION POLICY* Stated when guest puts up CC #. Owner happy to work with any cancellation requests from guests on unforseen issues. Call or text us.